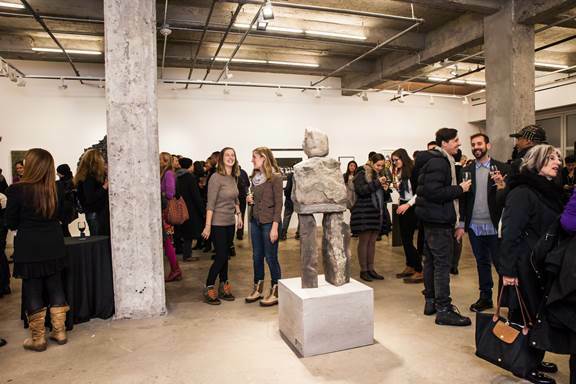 Building SculptureCenter is an exhibition and sale to benefit the SculptureCenter‘s recent expansion and renovation. On view only from February 3-5, all of the proceeds will be invested in future SculptureCenter programming. Hosted by Maccarone NY, The Building SculptureCenter exhibition caps a $5 million campaign that has positioned the organization to play a defining role in the international contemporary art field and in its neighborhood of Long Island City, Queens far into the twenty-first century. To date, almost $4 million has been secured with lead gifts provided by the City of New York. Building SculptureCenter is featuring more than 25 works donated by artists who have shown at SculptureCenter as well as those who respect and support the organization’s work. Highlights include a peacock painting by Carol Bove, a bluestone figure sculpture by Ugo Rondinone, an apple leaf painting by Nate Lowman, a sponge painting by Adam McEwen, a black glass “mirror” by Fred Wilson, a rare large-scale wall sculpture by Ursula von Rydingsvard, a new photograph by Louise Lawler, and a plaster panel by Oscar Tuazon. “Artists have always been among our most loyal supporters and I am humbled by the generosity these artists have demonstrated,” stated Mary Ceruti, SculptureCenter Executive Director and Chief Curator. “All proceeds from this sale will help secure SculptureCenter’s future and enable us to continue taking risks with new ideas and exploring the potential for contemporary sculpture.” This is truly an artist driven organization.